From super simple to complex creations, Popsicle sticks, or craft sticks, can be used to make a variety of craft projects. However, finding a way to make a craft project without spending any money is a challenge no matter what. Making free Popsicle stick crosses is an ideal craft project for a Sunday School class or Christian-oriented camp or day care. The crosses can be worn around the neck, given as gifts or displayed in the crafter's home. Rely on found or donated objects and supplies you already own to make a free Popsicle stick cross. Ask neighbors or friends to save Popsicle sticks for you. Wash them with soap and water and allow the sticks to dry thoroughly. You need two clean, whole sticks to make a cross. Place one stick vertically and lay the other over it horizontally to form a cross. Place a dab of glue at the intersection where the two sticks meet, then turn the top stick over so the glue is sandwiched between them. If you do not have glue, find a small length of wire, pipe cleaner, string or yarn. Tie the sticks together, placing the knot in the back where it can't be seen or twist the wire or pipe cleaner around the sticks to secure them together. Embellish your Popsicle stick cross with craft items you already have, such as paint or glitter. 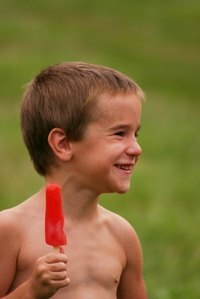 If you want to wear your Popsicle cross as a a necklace, drill a small hole in the top end of the vertical stick before attaching the second stick. Thread a piece of yarn or string through the hole when the cross is finished and tie the ends of the yarn together for a necklace. Though not technically "free," you can also get Popsicle sticks by saving them yourself when you and your family eat ice-cream treats. Craft sticks can be purchased inexpensively at most craft supply stores.